Barbara Kraft “a former journalist for Time magazine and contributor to USA Today, The Washington Post, the Los Angeles Times, the Los Angeles Daily News, LA Weekly, People, Architectural Digest and Angeles, is a seasoned writer intimately conversant with the needs of the media. Barbara Kraft is also an independent radio producer and writer” Kraft has written a memoir of Anaïs Nin: The Last Days available on the Kindle through Amazon.com. It already has a five star rating from reviewers. Normally, one is wary of any book that receives all five stars as generally it means the book has been reviewed mostly by friends of the author, however in this case one can see it is a book that is a stellar masterpiece, and as one friend just wrote, OMG what a memoir. The Last Days A book that will not disappoint Nin afficianados (afficianadi! to be hyper correct) of all stripes and types. 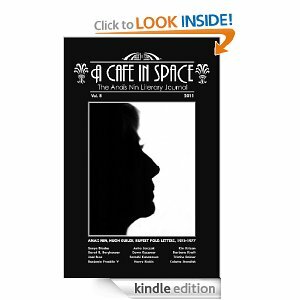 Published by Skyblue Press a preface an excerpt of the memoir appeared in the 8th Volume of A Cafe in Space: The Anaïs Nin Literary Journal. Please remember, that you do not need a Kindle to read this e-book. The OMG what a memoir! friend that emailed us about the memoir downloaded it and read it on her computer. Anaïs is blessed to have this last bright blessing from a seasoned writer and devoted friend. How lovely that Anaïs who blessed so many young with her compassionate friendship through correspondence with her gift for “furrawn” the Welsh word that means “the kind of talk that leads to intimacy” experienced this precious healing with Kraft in her last days. This book deserves even more reviews to show up in Amazon’s rankings for Memoir so for all the followers our our blog, please download and share your thoughts today!